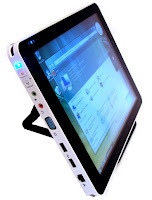 The iTablet T221 is the newest Ultra Mobile PC from Amtek, the OEM manufacturer. The iTablet T221 features a 12.1 inch screen with 1024 x 768 resolution, 1.2 GHz Intel Core Duo Processor, 60GB Hard disk drive, and a maximum memory of 2GB. The iTablet T221 also features an Intel GMA 950 graphic chipset and supports I/O-802.11a/b/g. This looks sweet however, I'm never really a tablet person. First of all, you get a 12.1 inch screen with no keyboard to type on. If that's the case then I'll just get a 12.1 inch laptop which probably is cheaper.